The famous tourist destination of the Caribbean Islands consists of West Indies along with few mainland countries like Suriname, Guyana, and Belize. The place is known for pristine beaches and natural alluring beauty. Caribbean medical schools follow the US Education based system and the physicians passed out generally fix in workforce countries like USA and Canada along with 2 years of clinical rotation program in teaching hospitals in USA/UK. The Caribbean area is turning into a preferred location by students who want to study medicine in quality institutions that too at an affordable fee structure. Students are willing to pursue medical education in the medical colleges due to various advantages like amazing location, good facilities and services and quality education in the top Caribbean Island colleges. The biggest advantage of studying medicine in Caribbean for the Indian students is that the education in medicine is affordable. The tuition fee and other expenses are comparatively lower than the private medical institutions in the country. Why should you study medicine in Caribbean Islands? There are various reasons as to why you should apply to the top notch medical colleges in the Caribbean Islands. For Indian students, the opportunity of studying in a good US medical college is far better rather than expending huge money on the management quota seats in any Indian private medical college. For Indian aspirants who do not want to give up on their dream of becoming a doctor and want to reach their epitome of success Caribbean Islands offers a good place for students to indulge in world class education, cutting edge infrastructure, perfect weather, beautiful beaches and the natural surroundings, delighting the students in an overall development. Of course Study medicine in Caribbean Islands is one of the best opportunities for the students in India looking for the endless success in the field of medicine at a comparatively low expense. The US Caribbean Islands offers the Indian students an easy admission policy. Unlike the Indian medical colleges, the entrance exams are based on practical approach. This makes it easy for students to apply to the Caribbean universities and secure an admission. Also, no entrance examinations like TOEFL and ILETS is required. The study pattern is accelerated and relies on more of practical knowledge rather than theoretical one. For the same reason, the students also undergo clinical rotations in good hospitals every now and then so as to broaden their medicine based thinking and understanding. The course program and curriculum offers high success rates. Also, the students have the chance of getting coached by the best professional teachers. Not only this the equipments and methodology used by the Caribbean Island medical colleges are all updated ones. The curriculum promises high success rates in the licensing examinations like USMLE, MCI, FMGE, PLAB, AMC, etc. The cost of MBBS Course is highly affordable and lesser than that of the private medical colleges in India. This suit the needs of many medical aspirants who wish to seek a promising future but cannot expend a lot of money for it. The universities are accredited with the NBME. The clinical exposure offered in such universities is nurturing for the students. What is United States Medical Licensing Examination (USMLE)? Unlike the Medical Council of India (MCI), in the USA, United States Medical Licensing Examination (USMLE) is a specially designed examination comprising of three steps in order to obtain medical licensure in the United States. It is sponsored by the National Board of Medical Examiners (NBME) and the Federation of State Medical Boards (FSMB). The core objective of United States Medical Licensing Examination (USMLE) lie is assessing the ability of a physician to apply his/her knowledge, principle, concepts, skills, and patient-centered expertise that are highly essential. These are also the basis of effective, safe, and satisfactory patient care. The three steps complement each other. No single assessments can standalone and hence it is necessary to clear all the three to achieve the medical licensure to become eligible to practice in the United States. This examination need to be cleared after completing your MBBS course. The Indian doctors are eligible and are required to clear USMLE with high score of 230+. Is USMLE easy to crack? It is easy to crack USMLE. The Step-1 in USMLE has a passing percentage of 94%. The USMLE Step 2 & 3 also has the pass score of 90%+ which can be easily scored if prepared seriously. What long it takes to pass USMLE? Generally, it takes 3 to 4 weeks for the achieved scores to be announced. An email to intimate you about your released score is sent by the responsible authority at the National Board of Medical Examiners (NBME) and the Federation of State Medical Boards (FSMB). The results of each step examination are published on their respective website also for the convenience of applicants. What is the age limit for USMLE? The good thing about it is that there is no age limit for USMLE. For information on it, you can also visit the official site of USMLE. India offers a tough space to students to clear the tough and tedious medical exam. Many Indian aspirants are not able to secure a seat in the Indian medical colleges due to reservation system and the fact that the exam is highly based on the theoretical aspect of education. Many Indian students look for options abroad that can nurture their dream easily without any entrance exam and also at an affordable fee. Unlike the private medical colleges in India, Caribbean Islands has a number of medical universities that offers world class education to the Indian students and an overall development phase. The only obstacle faced by Indian students is that after you’ve studied in a foreign university you have to undergo a MCI screening test in order to practice in the Indian subcontinent. However, there are five countries namely US, UK, Canada, Australia, and New Zealand, after you’ve graduated from universities in these countries you do not have to undergo a MCI Screening Test. There are a number of MCI approved universities in Caribbean Islands that provide quality medical education and a chance to pursue your dream of becoming a doctor from US. These universities include New York Medical University, Alexander American University, Washington University of Barbados, and American University of Barbados, Texila American University, and American University of Antigua. A private biomedical health sciences university based in Valhalla, New York, New York medical college is one of the reputed medical institutions in the US. The school offers its medical education in forms of three schools including the School of Medicine, the Graduate School of Basic Medical Sciences and the School of Health Sciences and Practice. The university excels in medical practice, healthcare administration, public health, teaching, and research. Established in the year 1860, the school houses a total of 800 medical aspirants from around the globe. The school has an affiliation with 20+ hospitals including the urban medical centers, small suburban clinics, rural medical centers, and high technology regional tertiary care facilities. Touro College and University serves as the parent institute to the New York Medical College. The medical institution has brought some great doctors and medical practitioners in the US and is appreciated widely for its clinical training methodologies. The medical center is lured for its world class infrastructure and its training opportunities and offers its medical course study within an affordable range. Medical students after graduating from the New York Medical College have to practice in a medical hospital affiliated with the university. This ensures a complete all round development of the medical practitioner. The New York Medical University is endorsed by MCI and it is one of the preferred choices of Indian medical aspirants interested in pursuing MBBS in Caribbean Islands with the great success. The Caribbean Islands are equipped with the US Education System and the curriculum follows the US based methodology in order to create world class doctors for the country. The US based method offers 4.5 years of theoretical and practical aspects of education followed by 2 years of rotational hospital based training. This is done in order to ensure that the MBBS students have a technical know-how of the process and know how to implement it as well. There is no entrance exam required to take an admission in the world class Caribbean universities. Unlike the Indian medical institutions which rely on all India based exam like NEET/AIPMT for granting an admission into its medical institutions, Caribbean medical schools do not require any such exam score. The course of study followed ensures that a student can easily clear examinations like USMLE, MCI, PLAB, AMC etc. The high success rates for such courses make the student competent enough to prepare for such licensed examinations. The course study is highly affordable. Unlike the private medical colleges in India, you do not have to pay a hefty price for studying medicine in the Caribbean Islands medical colleges. The medical universities in the Caribbean are approved by MCI and so you can easily practice after the completion of your course in India. The universities offer Indian students with good clinical exposure both in terms of theoretical and practical based teaching. The standards of education are very high and the surroundings around are very nurturing and welcoming. The place is also a hotspot for tourism and so studying in Caribbean medical schools will indulge you in an overall development. Why Study Sevenseas for MBBS Study in Caribbean Islands Admission? Based in Delhi, Study Sevenseas is amidst the trusted overseas education consulting company engaged in offering the complete admission solution to medical aspirants in India. With over 500+ visa processed and partnership with the top medical universities in European nations and other countries in the world, we acclaim to be the best study abroad consultant. 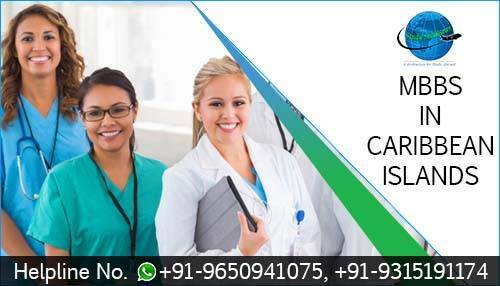 We assure our students the professional, satisfactory and complete support in seeking MBBS Course admission in Caribbean Islands and other destinations in the world at a low consulting fee in India. Contact us today for the detailed information and counseling free of cost!